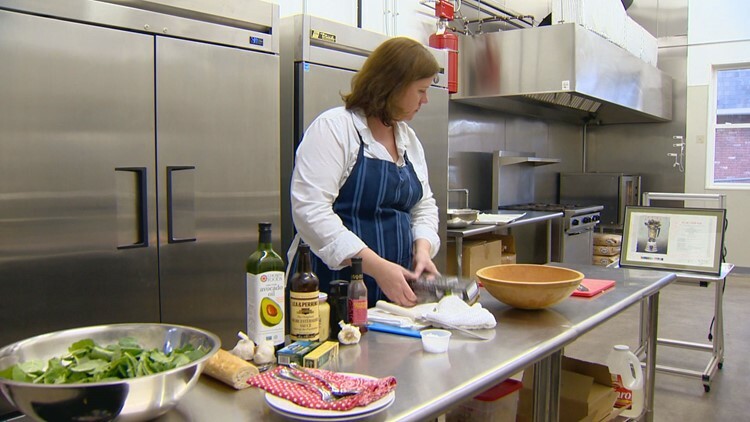 Anne Herbst introduces us to a local woman who thinks that her magic Caesar salad should be the centerpiece of every meal. Here's her recipe. Serves 2 for a main course, or 4 for a salad course, supposedly. In real life, this is about right for the salad course for 2-3, and on more than one occasion, I've witnessed a single human eat this quantity of salad, solo. This salad is mighty powerful, but its strength comes from a balance. If you make this salad thoughtfully and don't skimp on ingredients or leave things out, people will love it and beg you to make it for them all the time. They will give you beautiful salad accessories to encourage you to make this salad. On occasion, you will catch them licking the bowl. Add salt and pepper to a big wooden salad bowl, ideally one bored from a single hunk of tree, with a rough interior that makes creating the paste for the dressing possible. Grate the garlic on a microplane directly into the bowl. Using the back of a soup spoon, grind the garlic against the wall of the bowl until it becomes a paste with the salt and pepper. Add the anchovies, and once again use the back of the spoon to grind it into a paste. Follow the same procedure, adding the Dijon, egg yolk, lemon juice and Worcestershire sauce, one at a time. Make sure that each ingredient is blended into a smooth paste with the previous ingredients before proceeding. Add the oil and vinegar and stir well to blend. 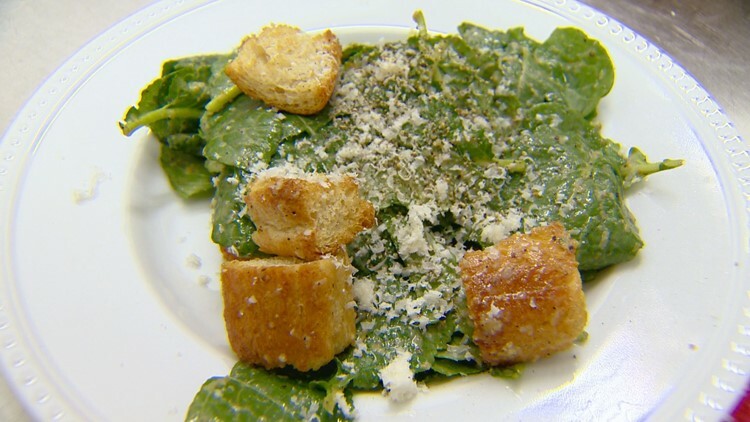 Tear the lettuce leaves into the bowl, and toss to coat with dressing. Sprinkle on the cheese, and toss again. Serve on plates with a little more cheese and freshly-ground pepper on top, along with croutons. Use whatever non-iceberg lettuce you want. Romaine, baby romaine, kale, that pre-washed spring mix - it all works. Use croutons or don't. Doesn't matter. If you use them, make sure they don't have lots of herbs/flavors - that would fight with the salad. You can also make your own: dice up some bread (cheap “hot and fresh at 6 p.m.” from the grocery store works well – you don’t want a thick artisan crust here), toss with olive oil and salt and cook on a baking sheet at 350 until brown. 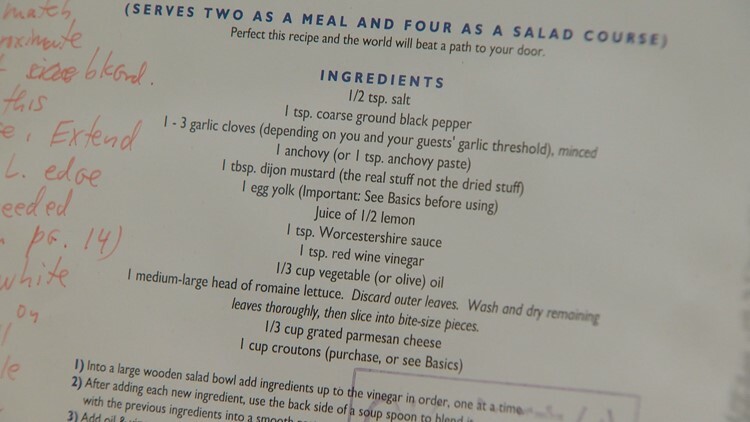 Put some freshly and coarsely-ground black pepper on when the croutons come out (don’t put the pepper on before baking – it can scorch and taste weird). The croutons for this salad are best without any herbs so that there are no flavors to fight the salad's already strong flavors. Throw in an extra yolk, more or less garlic, more or less lemon/oil/vinegar, according to your taste. Increase or decrease the dressing amounts according to how coated you want your greens and how many greens you have. This recipe doubles well, but you'll need a second bowl. This is truly The Big Salad. Sometimes, if I find it looks like I won't have enough dressing once it's made and in the bowl, but before the lettuce goes in, I adjust it by increasing the garlic by a couple cloves, throwing in a little more of the anchovy paste, Worcestershire, lemon, vinegar, pepper, another yolk, and 1/4 cup or more additional oil. Just keep tasting it to ensure that the balance seems right. Do not use anything other than garlic that you peeled, cleaned and pressed right there and then. Garlic powder and its cousins will not work. That pre-peeled and minced garlic in the jar in the produce section is not good in this salad - too bitter. If you don't have a microplane, you can mince it very finely (with the salt - helps make a paste on the cutting board) and then press hard with the spoon in the salad bowl to make it a paste. You have to use freshly-ground pepper, straight from a pepper mill. Pre-ground will not work. Coarse is better. Use plenty. The anchovy is not optional. You can't taste it in the salad, but you'll know if it's gone. My sister fears anchovies, and for years I lied to her and told her that when I made this salad for her, I left out the anchovy paste. She found out the truth because I fessed up. She was mad because she now knows that she wouldn't love the salad without the fish. But she never knew it was there. And I still make it for her with anchovy. Dijon mustard is a must-have. You cannot use yellow mustard or even brown deli mustard. And no powdered mustard, clearly. Grey Poupon is the one I always use. Don't go crazy with the lemon or vinegar - this salad should punch you in the head, but not make you pucker. I find that I generally use less acid than I think I should, and it turns out to be just right. You can cheat and use bottled lemon juice, as long as it doesn’t have any additives – especially avoid bottled juice with added lemon oil, because the oil will make the salad dressing taste like furniture polish. You have to use parmesan that you grate right before making the salad. The best is cheese from this one tiny region in Italy that gets to be called Parmigiano-Reggiano; it's handled in a specific way. It's best if you get it cut from the wheel in store - not cryo packed. It's pricey, but it's amazing. Buttery, salty, with little crystals - you'll have to chase people out of the kitchen while you're making the salad because they WILL try to steal cheese. If not, just get some whole piece of parmesan - Argentina exports a lot now - but it must be grated right there and then, while you're making the salad. Have I been clear? No pre-grated cheese, even the gourmet kind from the deli! If you don't have a wooden bowl, just use a big old glass bowl. But whatever you do, do NOT make this dressing in the blender. It will get a weird mayo-like texture that is not right. The amount of garlic to use really does vary based on how hot the garlic you have is, and what you and your guests' tolerances are. I've made it too strong before. Usually, I end up using about three cloves for friends and five for family, and that's a good starting point for a salad that will knock you back in your chair but won't make you cry. When I make this salad for just my sister and myself, I start with a whole head of garlic. I always use a fresh raw egg yolk, and I don't look back. I buy the organic free range eggs, and I live under the illusion that this protects me from salmonella. This is probably not the case. If you're nervous about bacteria, you can coddle the egg before you use it. Certainly, don't use raw yolks if you're feeding a small child, pregnant woman, or anyone with a compromised immune system. A New Zealand Sauvignon Blanc from Marlborough County goes well with this salad, as does an unoaked Chardonnay. You could even pair a drier Riesling – the heat from the garlic goes well with the sweetness of that wine.